You know those days where nothing sounds good? The sort of days where you are laying on the couch with a splitting headache and the hardest decision of your day is "What on earth am I going to make for dinner?!?!" well I had one of those such days not too long ago and decided that something needed to be thrown in the crock-pot, so I could basically lay down on the couch and hope my head wouldn't explode. Well that's how this recipe was born. 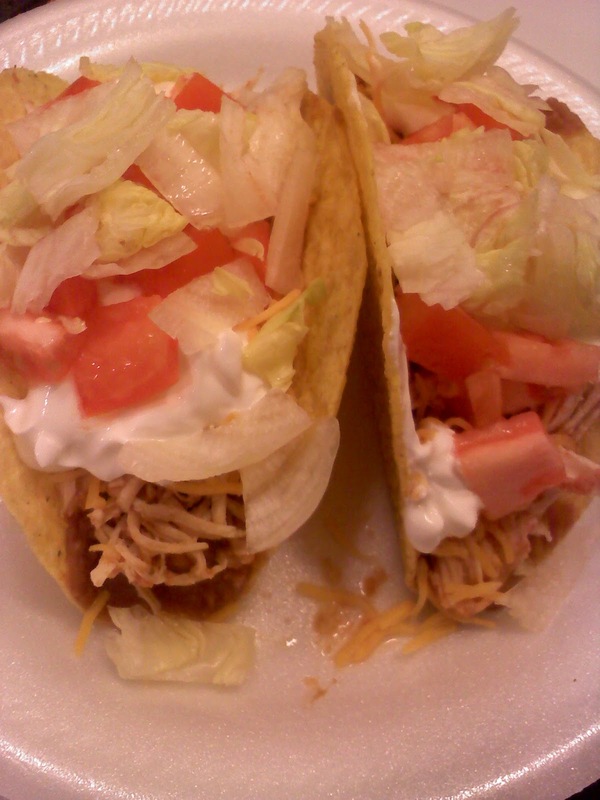 I had everything in my pantry and freezer to make tacos, but you can't cook hamburger in the crock-pot very effectively, so I figured why not make chicken tacos? I threw a bunch of stuff in the crock-pot, turned it on and within an hour it smelled amazing in my house! I absolutely love those sort of dinners, where you are a little worried how it might turn out because you hastily threw it together and it ends up being a new favorite! And this chicken was SO versatile! I used it in tacos, quesadillas, bean and cheese burritos, tostadas... Yum! I was surprised at how much we honestly enjoyed this chicken, even The Farming Tot loved it in his quesadilla! I really hope you try these soon, they're a much healthier alternative to eating ground beef tacos, and quite frankly I think they were more flavorful! Spray your crock-pot with some non stick cooking spray. Place the chicken breasts in there, and add in remaining ingredients, and mix. Cook on high for 1 hour, then on low for 4 hours. Once the chicken is done, shred with two forks and place back in the crock-pot on warm until you are ready to use. This was so easy, it almost seemed wrong! We all really enjoyed it, and I have to say it was amazing as tacos, but I really loved it in a burrito with beans and cheese, some Mexican rice thrown in would be wonderful too! And it wasn't so spicy that little one's can't eat it either, as the Farming Tot really enjoyed this! 4.5 stars. In tacos! I used the flat bottom ones, loved it! 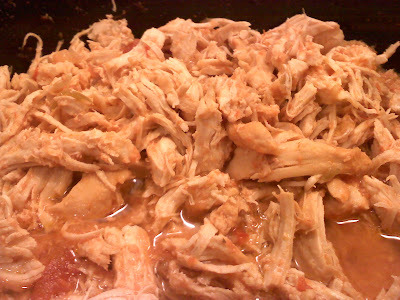 This is my kind of recipe-one that can be made in the crockpot and totally flavorful!